The Diamond State Chorus is a membership organization of female singers, who meet regularly to practice, perform, socialize, and have fun. We currently have 25 singers of all ages, all walks of life, and from all parts of northern New Castle County and surrounding areas. Our Mission is to perpetuate the barbershop style of music through high level performance and audience education. We encourage continued education and improvement in our individual singers as well as the chorus as a whole, and provide opportunities to do so. The main purpose of Diamond State Chorus is to entertain the local community and expose audience members to the art of Barbershop singing. The entire chorus sings at numerous community and private events and small groups are also available for singing telegrams (Singing Valentines, Christmas Cards, Birthdays, and other special occasions). In addition to sharing our music with others, we are committed to learning more about the art of barbershop singing. Vocal instruction is a regular part of chorus rehearsals and a very important component of the chorus experience. Several times each year we also receive coaching from outside experts in the art of barbershop. In the spring of every year, Diamond State Chorus participates in the Region 19 chorus competition, currently held in Ocean City, MD. Quartets and choruses from our region come together to sing for each other and get feedback from a panel of judges. Competitors with qualifying scores in both quartet and chorus categories are invited to compete at the international level. 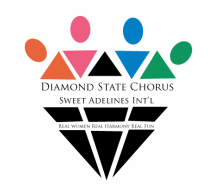 Diamond State Chorus is a chapter of Sweet Adelines International, a non-profit organization of approximately 30,000 members in choruses and quartets, worldwide. The Headquarters is in Tulsa, Oklahoma.